Colors, colors, Dibadu! Barbara Wolff lives and works in Germany, at the border of the Teutoburger Forest, close to the town of Paderborn. 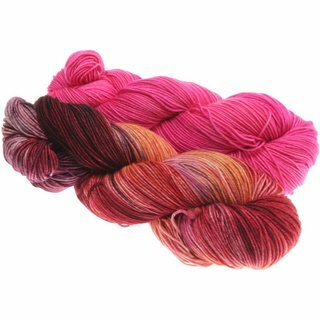 And she loves colors, and that's the first thing you will notice when looking at her gorgeous hand dyed yarns. When she knits herself, she will always choose a multicolored, preferably modular project: "Knitting with just one color, that's just not me!" she says. 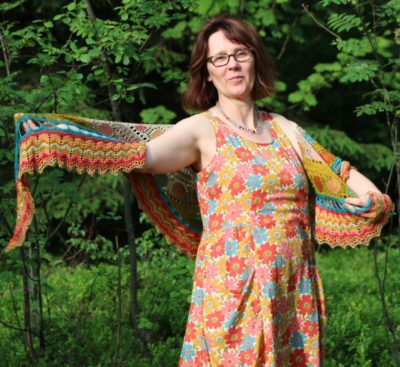 "I love to work with lots of different hues and shades, even if I have to weave in 295 ends when I am done!" Her passion for crafting goes way back: "I was one of those students who would constantly knit during class in the 70s and 80s" she recalls. After finishing school, Barbara went on to become a flutist and music instructor. When she and her husband started a family, her knitting career took a break: "With four kids it's kind of hard to find time and peace for creativity", Barbara says. When her youngest son turned three and started to attend daycare, that changed: "I remembered what was most fun to me when I was a teen: Knitting!" She started to look for beautiful yarns and soon discovered the world of handdyed beauty. 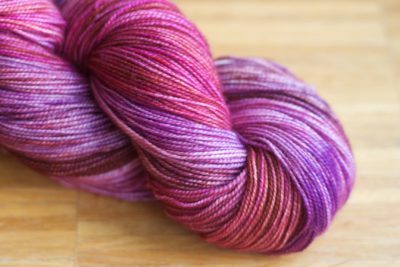 "Handdyed yarn – that sounded exciting and promising", she says. She started to experiment – and has not stopped working with colors and dyepots ever since. The step from music to colors was not a big one for Barbara: "I am a synesthetic. In my head, numbers, letters and sounds each have a different color", she says. 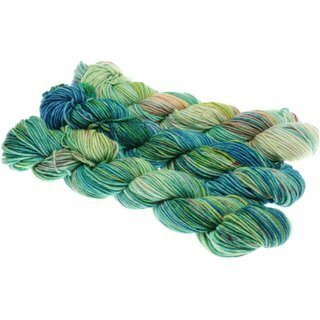 So, in a way, Barbara composes a symphony of colors with each hand dyed skein for us! A Trio Aquarell from Barbara's workshop (Photo: M. Behm). 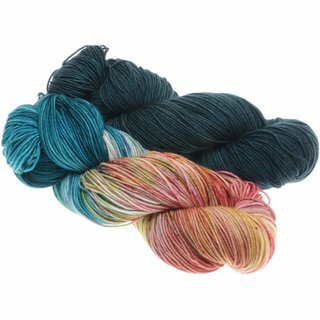 "When I dye yarn, I make sure the colors are harmonic and pleasant when knit up – it should not pool unless it's intended to", Barbara says. She tolerates pooling only when it is planned, like with her "Sockenmaler" ("Sock painter") or "Maschenmaler" ("stitch painter") yarns. Her specialty are her "Trios": Combinations of three skeins that are meant for one project, but differ. It may be a subtle gradient, a common sprinkle pattern or an underlying tone. "Each Trio tells a story with three voices", she says. Her artful yarns can be admired at fiber festivals or in her online store: from light cobweb angora to chunky wool, combinations of 2 big skeins or mini skein sets – everything turns into colorful beauty under her hands. We are very curious about what she will dye for Strickmich! Club 2018 – and are more than happy that Barbara agreed to contribute one of her wonderful yarns to our Club. Welcome! P. S.: Sign-ups for Strickmich! Club will start on November 6th here on our Club website.